It’s not every day that I go all out on my makeup, but for NYE and other special occasions, I love a good smokey eye paired with a glowy, Snow White complexion. I am pretty fair anyway, but in the winter when my skin hasn’t seen sun in months, I’m about as pale as can be. I love to keep it fresh and glowy and pairing my skin with a smoldering smoky eye with lots of shimmer really speaks to me. I rounded up some of my favorite products to share with you how I channel my inner badass Elsa vibes. Enjoy! 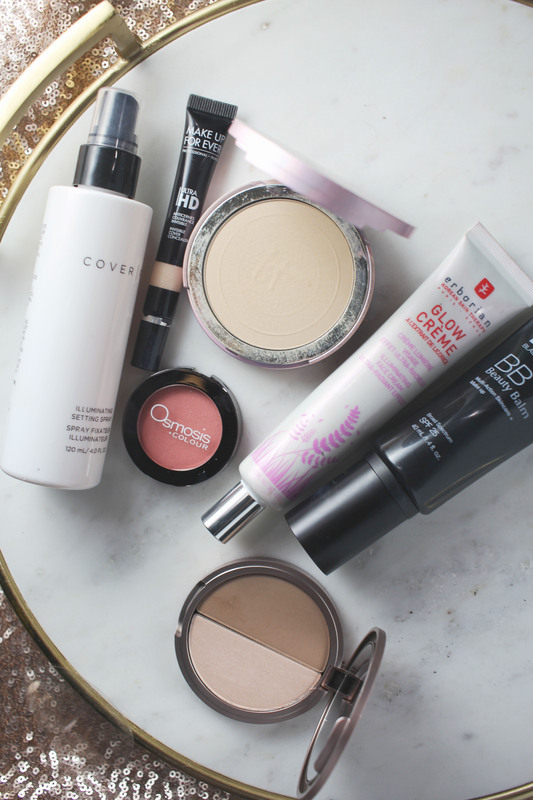 Amazing skincare is always the first step to any good makeup look. Ren Glycolic Lactic Radiance Renewal Mask is amazing for uncovering beautiful glowing skin. For the rest of my skincare, I’ve been enjoying my HG serum from Clinique that helps me when I have acne issues AND it targets anti-aging. Seriously, check it out if you have dry and acne prone skin. This is my second winter in a row that I have been living for Clinique Acne + Line Correcting Serum. 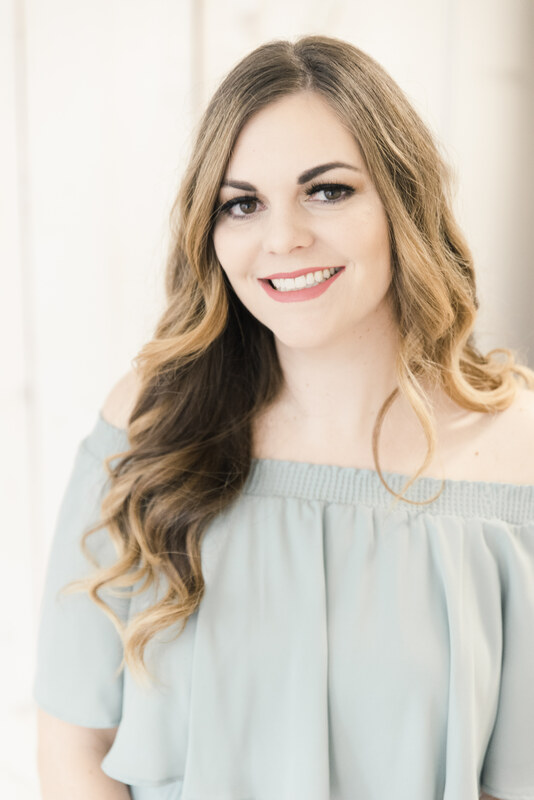 I always always always (without fail) put the Farmacy Honey Savior on my eyelids right under the brow, and in the corners of my lips where they get dry in the morning and at night. I’ll share with you soon how this has been seriously saving me while I battle terrible dermatitis in the winter. 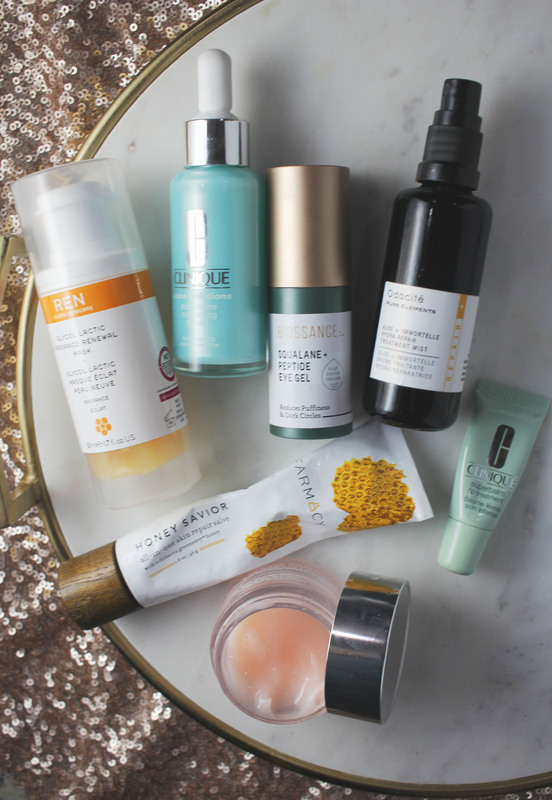 Biossance Squalane + Peptide Eye Gel is awesome for eye cream, and Clinique Moisture Surge is awesome to lock in all that awesome skincare as the top layer. It’s the most hydrating moisturizer on the planet for people with sensitive skin that is also acne prone. Superbalm goes on my lips to keep them soft and ready for lipstick later, and Odacité Aloe + Immortelle Hydra-Repair Treatment Mist gets spritzed everywhere just for an extra dewy glow before applying makeup. Call me high maintenance, but this skincare is the BEST of the BEST and has kept my skin under control in this frozen tundra I like to call Wisconsin. When I do smoky eyes, I like to do them right after my skincare and before the rest of my face makeup in case it makes a mess. 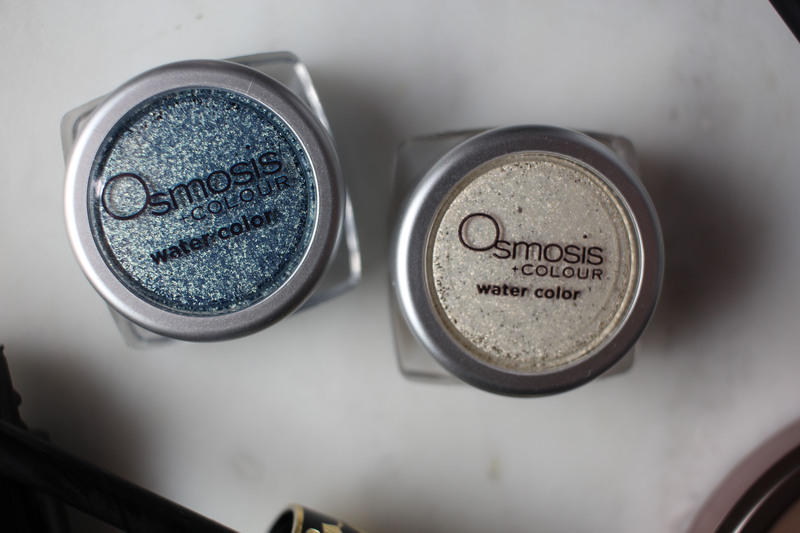 I am living for Osmosis Colour Water Color High Intensity Loose Shadows. I have the shades Azure and Opal. 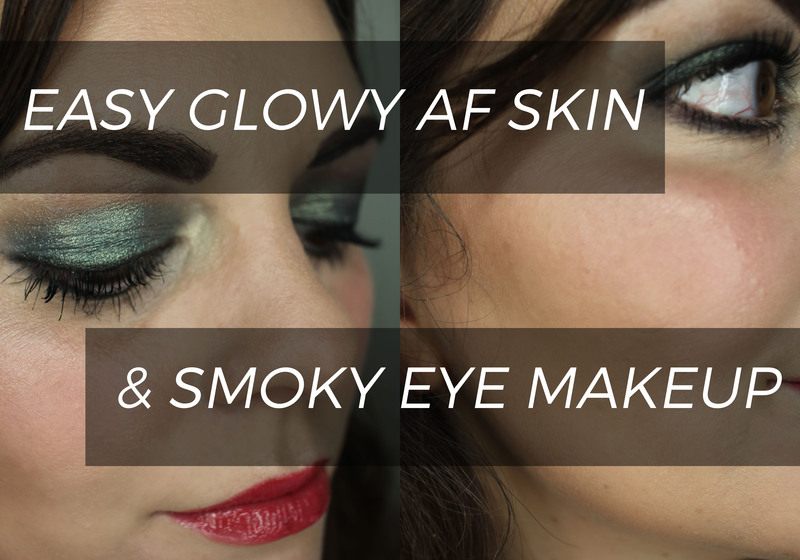 The way I achieved my glimmery and bold smoky eye was so easy! I first applied MUFE Ultra HD Invisible Cover Concealer in Y21 to my lids. I love that it’s not a real primer because it’s not tacky and blends right into my eyelid without creasing and to provide full coverage to my lid. Next, I applied the contour shade from Osmosis Lustrous Contour Duo to my crease (any matte brown crease shade will do) and applied Osmosis Eye Pencil in Black from my lid to my crease and smudged it out with my finger. This is the perfect smoky eye pencil because it stays really well once it sets but there is time to play to get it to go on smudgy. It looks sloppy, but not to worry- I’m not done! 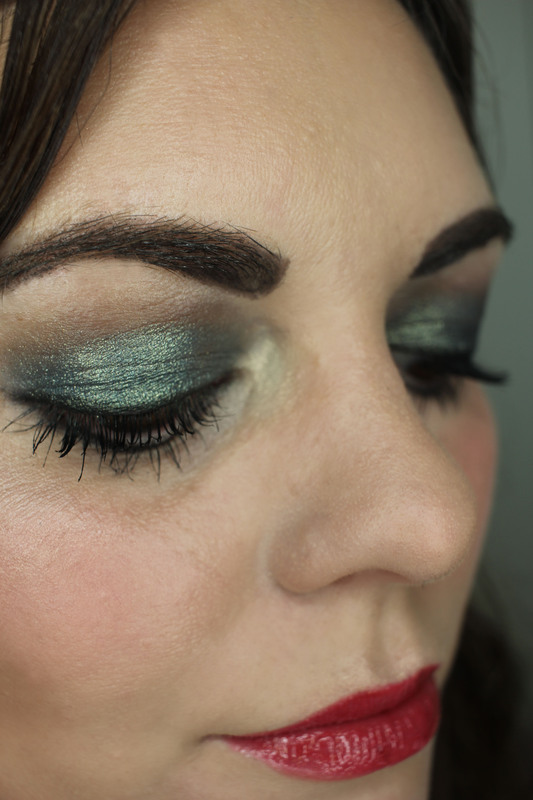 Next, I applied clear tape to the edges of my eyelids and very lightly applied the Azure shade of the loose shadow to my whole lid below the crease with my ring finger. I never went into the jar, just took from the lid. Easy peasy. The tape ensures that none of this stuff will go flying all over. Cleanup is so simple! Just pull off the tape! I’m skipping to the face part before finishing up the eyes. I love applying Erborian Glow Créme to my face as a primer. I then follow up with Dr. Jart+ BB Beauty Balm which I absolutely LOVE. This is new to my stash. It gives poreless perfection and really great coverage while being light and fresh and looking just like skin. 2 pumps with a damp beauty blender is perfection. The MUFE concealer from earlier goes under my eyes and around my nose, and everything is set with It Cosmetics CC+ Airbrush Perfecting Powder. 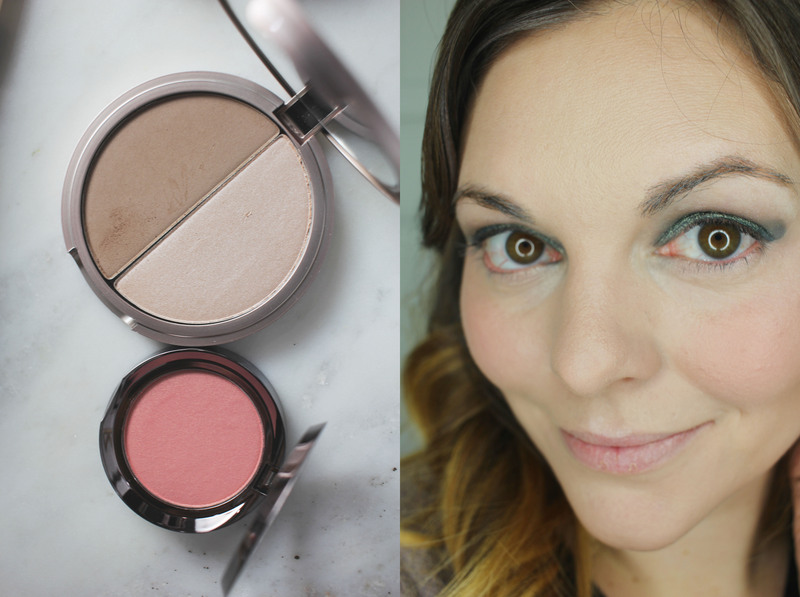 A pop of Pink Pearl goes on my cheeks, and I lightly contour and highlight with the Lustrous Contour Duo. I absolutely love this blush color. It gives so much life to my cheeks! And the contour and highlight are super pretty too. Now that I’m finished with the rest of my face, it’s easy to go back in to the eyes and fix a few details. I don’t like to do my brows until my face makeup is complete, so I go back in and apply Osmosis Brow Gel in Brown (my favorite!) and It Cosmetics Brow Pomade for some extra hold. The tape being pulled off created a harsh edge on my eyelid, so you can either soften it or keep it like that. I use it as a guide to apply more of the Osmosis liner in black and wing it out ever so slightly, and put some underneath my eyes as well and use the smudger brush to soften the line. Opal is so gorgeous it goes great on the inner corners of the eyelids. 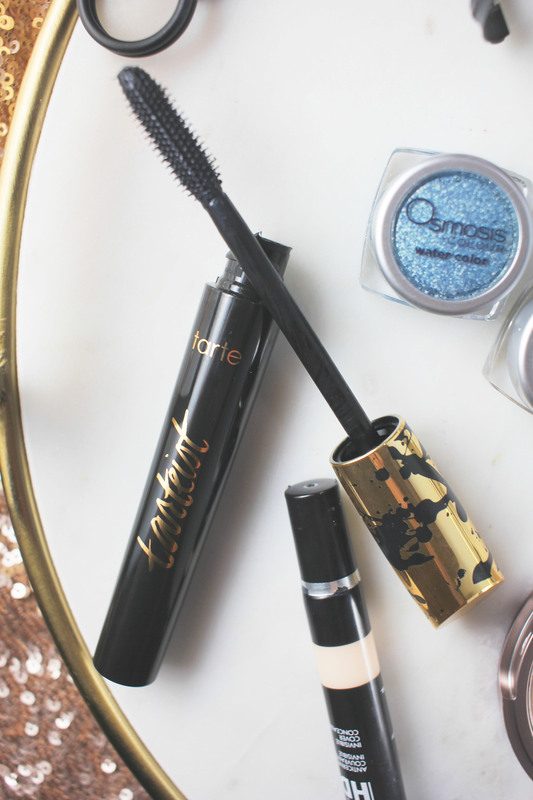 Tarte Lash Paint is my jam for mile long lashes right now! 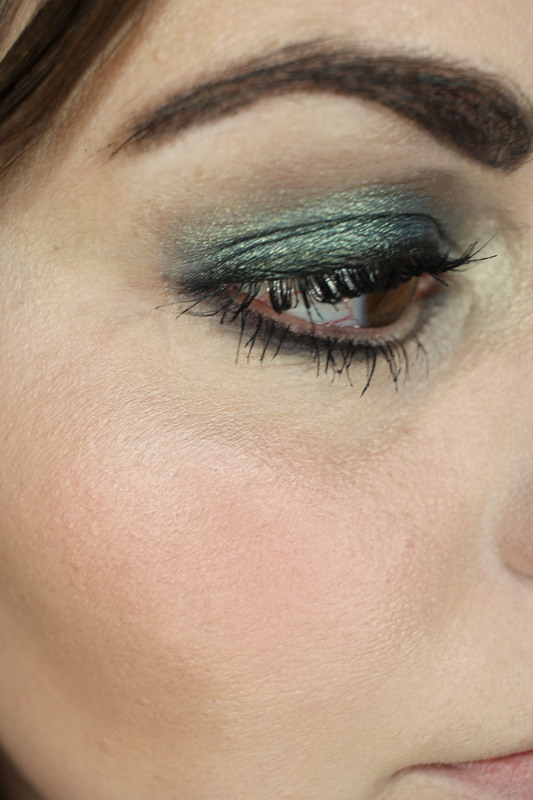 You could certainly add false lashes too but then this look wouldn’t be “easy”- or at least not for me! I absolutely love the way the whole face turned out and I knew that everything would be bulletproof because of the products I used. Setting everything with Cover FX Illuminating Spray was a great final touch as well as using Lipsense. I added 3 coats of Roseberry with the Bougainvillea gloss over top. Finally, I added a bit of the Opal to the high points of my cheeks because I wanted to get a little more flashy. LOVE the way it turned out. That’s it. I love this because it was so simple but I feel so pretty, so glowy, so fresh, and so shimmery! Best of all, everything is super easy to do. I did this whole look while holding my one year old on my hip. Truth. 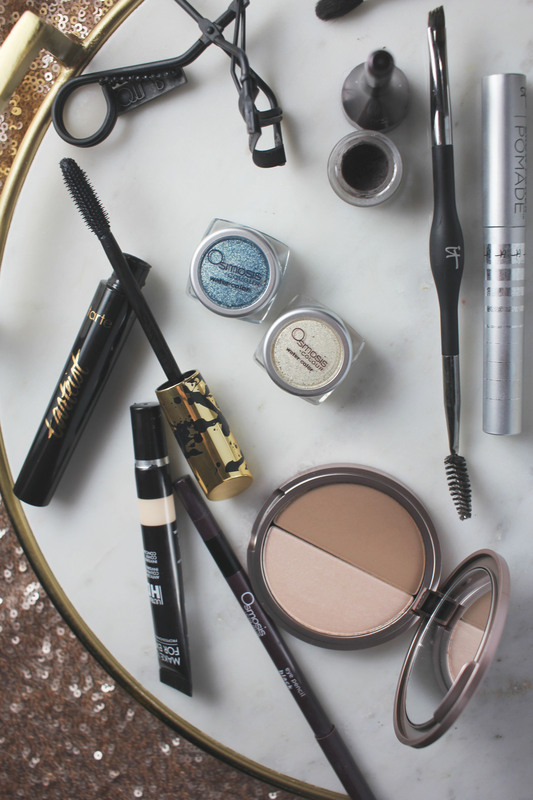 You could totally sub out any of these products for things you have at home, but if you want to splurge on one thing, try the Osmosis High Intensity Loose Shadows. I’m super impressed with them. They stay forever and they are so pretty and flashy. They photograph super well and look amazing in person too. 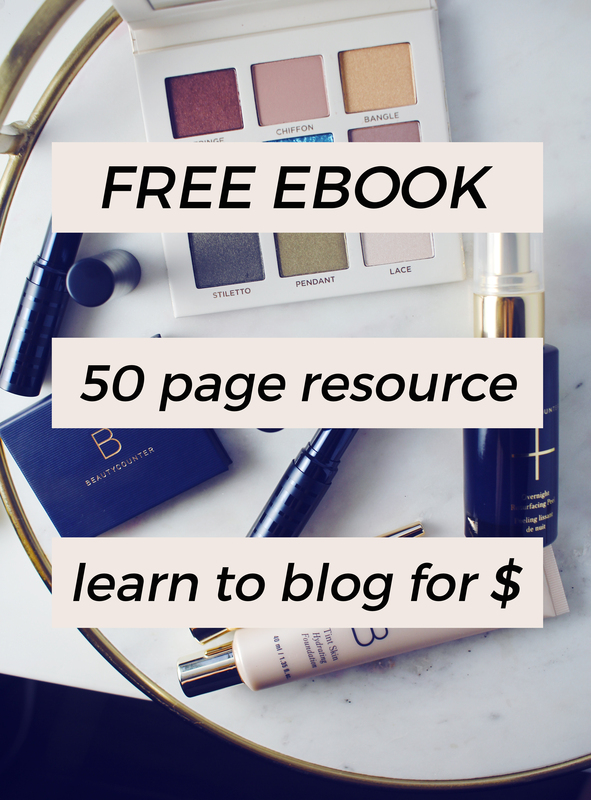 I love the idea of a budgeproof glossy lip and a smoky/shimmery eye. And of course everything looks so much better with great skin! Do you have a go to look when you are wanting to get super fancy?